In July 2014, the first Celebrating Excellence Event will be held at the Heath Campus over three days. 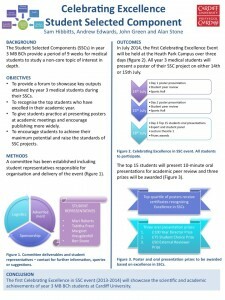 All year 3 medical students will present a poster of their SSC project on either 14th or 15th July. The top quartile of posters determined by student peer review will receive certificates supporting excellence in SSCs. This entry was posted in Cardiff University Staff, Cardiff University Students, Year 3 SSC and tagged Celebrating, Excellence, SSCs on February 19, 2014 by Sam Hibbitts.